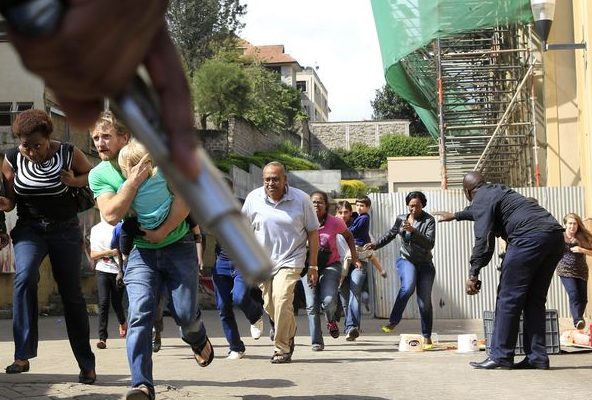 The American cable TV network HBO yesterday premiered their Westgate documentary,Terror at the Mall. British filmmaker Dan Reed assembled thousands of hours of footage gleaned from more than 100 security cameras inside the mall and video from television guys. He has worked on the project for almost a year, and embarking on it just weeks after the attack. He managed to track down over 200 people and interviewed 82 of them on camera. The survival accounts are just incredible, but the images and the CCTV video footages extremely shocking and some disturbing. Among the footage aired in the almost 2 hour documentary is one where KDF soldiers ‘bombed’ Nakumatt mega store. They believed the gunmen were hiding inside the supermarket, and the quickest way to conclude that matter (according to them) was to bring the entire Supermarket down to the ground. The gunmen who are believed to have died in the fire and that was the last CCTV footage recorded.